Brewers Decorator Centre is arguably the best-stocked supplier in Derby. We carry large quantities of trade and designer paint and, with our protective coatings expertise, stock and source a range of specialist paints and finishes. We also keep a good number of wallpaper pattern books in store to aid coherent interior design, and assorted decorating tools, products and equipment. You can trust our team to give you excellent service and advice too; all members of our counter staff have been with us for more than 10 years. We’re easily found on Stores Road, just off the A61. Take the turning opposite SOS Supplies on Stores Road and we’re on your left about a hundred yards down. There’s plenty of customer parking outside so you can load up with supplies, and we can also arrange local delivery. 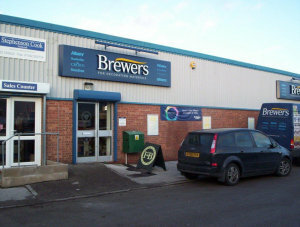 Travelling from Nottingham Road on to Stores Road, continue on until you see a grey and green industrial unit on your left. Derby Trading Estate will be the turning immediately on your right. Turning off of Mansfield Road on to Stores Road, Derby Trading Estate is the first turning on the left.